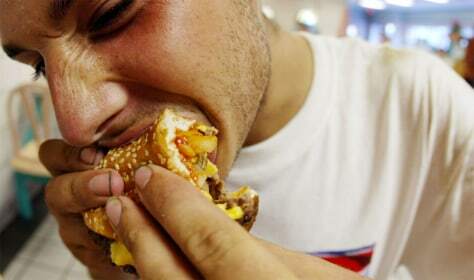 A McDonald's customer in Miami Beach, Fla., enjoys a double cheeseburger. McDonald's recently said it would phase out its supersized meal offerings. But many restaurant portions remain large, designed for a public that has shown its craving for value over taste, and a recent study highlighted the large portion of calories we get by consuming too many sodas and sweetened juices and beverages.